Activity Type: Short, self-guided trail to an overlook of the Confluence of the Baker and Nef Rivers. Distance: The trail-head is 12 km south of Bertrand and the well-marked trail is approximately 800 m.
Special Considerations: The trail is flat and well-marked; however the rocks in the area of the confluence can be slippery so proceed with caution. Scientists indicate that the rivers and lakes of Chilean Patagonia are not only a globally important reserve of freshwater; they are one of the most complex and least altered environmental systems on the planet. Without a doubt, the Baker River embodies the essence of these qualities and in recent years, has become one of the most emblematic rivers of Patagonia and of course, Chile. Ayséninos are EXTREMELY passionate about this River; it is the most powerful of Chile’s rivers with an average flow of 1,100 m3/s); it is one of the most pure of Chile’s watersheds, receiving its waters from General Carrera Lake and the tributaries of the Northern Patagonia Ice Fields. Also, thanks to an abundance of glacial sediments, it is a river of spectacular and undeniable beauty. In the sector of the confluence you’ll be able to see this power in all its’ splendor. To visit, head 12 km south of Puerto Bertrand along the Carretera Austral, in the direction of Cochrane. During the short drive, you will be accompanied by the river itself, joining you from time to time to remind you of the indescribable turquoise color of its waters. There are several observation points along the way, beginning in the first kilometer, where you can walk down to the shore and observe the rapids, known locally as “El Potro”. These waters are popular amongst white water rafters who enjoy the ride of the first seven kilometers of the river, three or four times a day, during the summer. Also in this sector, you’ll find various fly-fishing lodges and cafes, where you can stop for a snack and be treated to fantastic views or organize an outing to try your luck and skill. In Km 12 you will see a wooden sign marking the entry for the sector of the confluence. Here you’ll park your car and walk a short trail (800 m), surrounded by ñirre forests, which are especially popular with the Chilean flicker and the striped woodpecker. As the trail progresses you will begin to hear the roaring sound of water becoming closer and closer with each step. Follow the sound (and the trail), which leads to some large boulders that form the riverbank and allow you to truly appreciate the grand spectacle of water that surrounds you. To your right, you will encounter an incredible waterfall that surprises you; not for its height (approximately 10 m), but for its tremendous breadth and the strength of the water that pours down toward the confluence, a few meters further, with the waters of the Nef. Notice that the crystal clear turquoise waters characteristic of the first 12 kilometers of the Baker River take on a more milky tone after the confluence with the Nef. These periodic and pronounced changes in color are characteristic of several of the sections of this river and are the product of the distinct sediments that the river receives from the specific glaciers and geologic formations above in the Northern Patagonia Ice Fields. 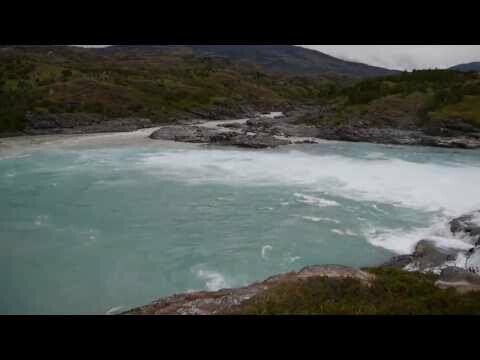 The confluence has been the emblem for the controversy surrounding the Baker River in recent years, a controversy which surrounds the best and most sustainable use of its’ waters and of the waters of many rivers throughout Patagonia. This river, along with others, like the Pasqua River further south, have been proposed as sites for large hydroelectric power projects that involve damming, construction of plants, and transportation of electricity via high-tension power lines, to other regions throughout Chile, and especially in the metropolitan areas. The projects are halted for the time being, but discussion and controversy continues.